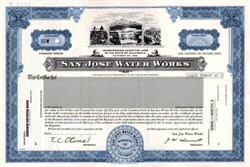 Beautifully engraved SPECIMEN certificate from the San Jose Water Works. This historic document was printed by the Security-Columbian Banknote Company in 1979 and has an ornate border around it with a vignette of a waterfall. This item has the printed signatures of the Company’s President and Secretary and is over 23 years old. San Jose Water Company, with headquarters at 374 West Santa Clara Street, San Jose, California 95196, was reorganized under the laws of the State of California in 1931, succeeding a business founded in 1866. San Jose Water Company is a public utility in the business of providing water service to a population of approximately 988,000 people in an area comprising about 138 square miles in the metropolitan San Jose area. SJW Corp. was incorporated in California on February 8, 1985 and is the parent company of San Jose Water Works.